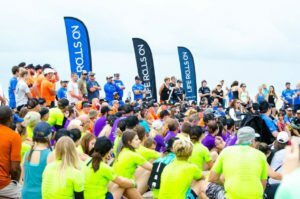 I attended the Life Rolls On Foundation surfing event in Carolina Beach, NC. 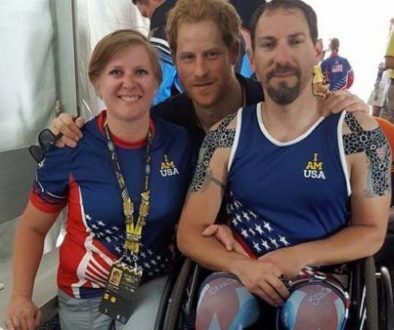 It is a non-profit that’s mission is to improve the quality of life for people affected by spinal cord injury. Coincidentally the event fell on my 10th year of being in a wheelchair from a car accident. Which my family now calls my Wheelie Birthday and what made it even better was my bestest friend came with me! The love and support from my family and friends gives me the strength to live life to the fullest and have a smile on my face while doing it! 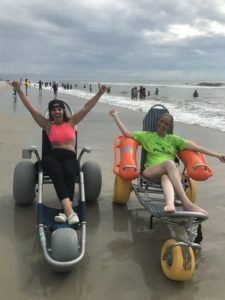 I love the beach but it isn’t always the most accessible place when it comes to being in a wheelchair. There is beach access where there is a carpet like mat but it’s never long enough to get to the ocean. If you are in a power chair going through sand is a nightmare. As soon as your tires hit you come to a complete stop and there’s no going back your tires just keep spinning while digging a hole. On the day of the event they had flooring that made the beach accessible for us in wheelchairs that an awesome group of guys laid out. Some of them were from Ocean Cure who teach surf lessons to those with disabilities and More Life who are veterans and they helped wherever they were needed. Don’t quote me on these numbers… but I do recall someone saying there was 500 volunteers and around 70 surfers. Everyone there was sooo friendly it was like you had known them your whole life and they were there to make sure everyone had a good time with no worries. 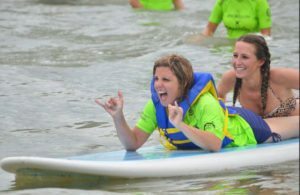 I also have to give a shout out to Kevin the owner of Odysea Surf School did the planning and coordinating and couldn’t have had cooler people helping out the whole day. I didn’t have a care in the world because people were there to help make everything easy for us. The volunteers took the hard part out of getting on the beach and in the ocean. They transferred me into a beach chair that rolls right into the water and then lifted me onto the surfboard. Then it’s time to catch a wave. Patience is key when waiting to get a good one (something I don’t have a lot of). Once you are on the wave you just hold on and enjoy the ride. When I would fall off people would be there to grab me as soon as I hit the water…which took away my fear of drowning and felt completely safe! Since I did have a couple wipeouts I feel like I can call myself a pro now and especially because a legit surfer told me that I have stoke! 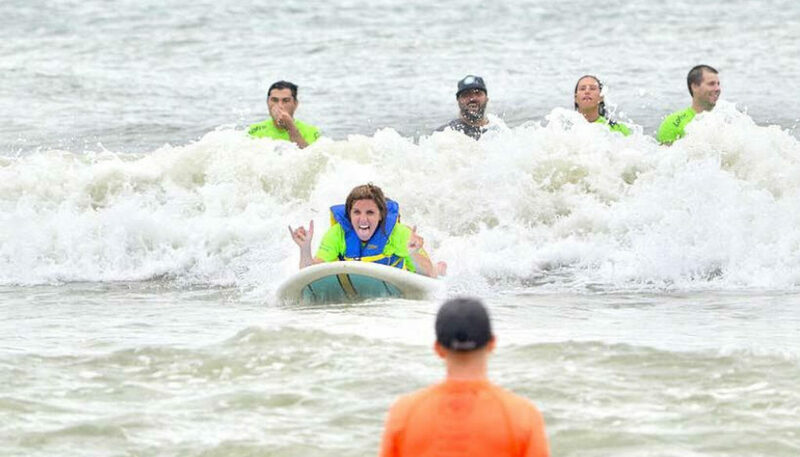 Overall, it was an unforgettable experience making new friends and learning how to surf. I will definitely be going back next year!